Fast filing, for when there’s no time to waste! With every new year, business owners and the self-employed tend to reflect on the question “how can I be better this year?” Getting your files in order is a great first step towards creating space for the things that matter and to make this process quicker and easier, Avery has a range of filing products to help you to reach your business goals. Space is a hot commodity in both offices and home-offices alike. Being smart with your space can help you keep things from getting cluttered and ensure that you’ve got room to think. If you’re starting out from scratch, the fundamental first step is to sort your documents into categories. Whilst you’re doing this, you can keep an eye on documents that don’t need to be readily accessible and can be archived or recycled. Once you have your paperwork sorted, it’s time to decide where to put them. 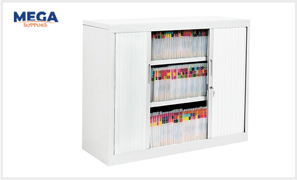 Avery has a terrific range of lateral files, with a variety of options to help you find a system that suits your needs. Storing files laterally is an easy way to save floor space, as they can be stacked at higher levels. Lateral filing also has the added benefit of being easy to colour code, so that when you’re all set up, you can find files (or identify mis-filed items) at a glance! 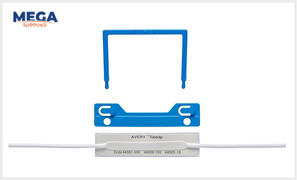 Consider fastening your files with something like Avery’s Tubeclip File Fasteners to keep your paperwork nice and compact - particularly important documents that you may need frequent access to. Given that an efficient filing system should save time in the long run, aim to find a filing system that will last you through the years. For important documents that you’ll be wanting regular access to, we recommend Avery’s extra heavy weight shelf lateral files. 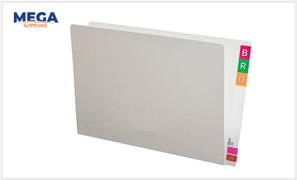 These are manufactured from strong weight board and include a reinforced side tab that can be labelled with colour code and file title labels. Selecting files that can expand is also a trick to ensure that you’re building a system to last. 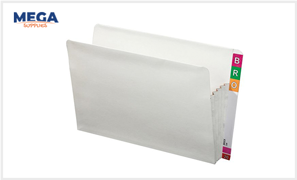 For times when you know you’ll have lots of thick and heavy documents to file such as annual reports or legal documents, selecting a concertina wallet style file could be a sturdy solution. Similarly, whilst you will need a system that lasts, you’ll also want a system that can be easily updated. Come spring, you may well be looking to do a quick refresh and labelling is a great way to avoid having to start over. 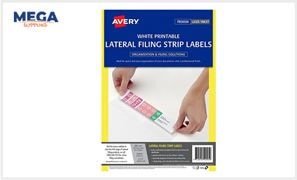 If you have many files to label and you’re keen to save time, consider using Avery FilePro® file labelling software and Avery Lateral Filing Labels to create a single strip label that has all your file information. Instead of individually applying coloured labels to your documents, you can apply one label to your file. The software also enables you to select from a range of pre-designed templates and colour options so you can find a customised system that suits your business. You can import multiple records using the mail merge feature that automatically colour-codes the file labels - fast! Once you’ve slotted all the right documents into their new labelled files, you’ll need to find somewhere to store them. This will really depend on how regularly you need to access the files, who needs access and how bulky they are. How your files are stored can make a big difference to how easy they are to find in the future for you and others. 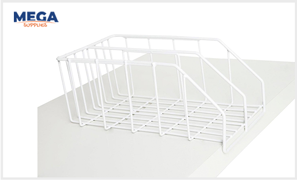 Files that only you need to access on a regular basis could be kept in file racks for desks, such as Avery’s White File Rack. With a lip at the front, this can be kept flush against the desk or on a shelf. Otherwise, you might consider a durable filing cabinet, such as the Avery Lateral Filing Cabinet. This is an easy solution for keeping all your colours in one place and with a variety of colour options doesn’t have to be a boring addition to the office!